This has been my go-to book for the basics. It includes everything from how to boil an egg to directions on making an angel food cake, lasagna or glaze for ham. Directions are precise and easy to understand. A few years ago my copy was becoming quite dilapidated. It has been, after all, more than 30 years that I'd been using it. That's a lot of cooking and no one has ever called me a neat cook! One day my husband came home with a box of brand new cookbooks he had discovered at a garage sale. "Now you can get rid of some of those old books," he said. No way!! Some things can't be replaced like that. This book is certainly one of them. He understood. For my next birthday he gave me another cookbook he had discovered at a garage sale. Same cover. Same edition. Same familiar recipes. Much better condition. A cherished gift. This book was a wedding gift. Like so many cookbooks, this a compilation of recipes contributed by many people. Most come from ladies of the Church of God in Christ, Mennonite. In the forward it says, " Good nourishing food is a concern of much of the Bible, however, we must always realize that spiritual food for the inner man is of much greater importance. This Christian Home Cook Book, contains sound, sensible, and understandable information and instructions as to how to assemble appropriate ingredients and make delicious and wholesome food." Among these recipes were Potato Refrigerator Rolls, an old standby for cinnamon rolls to go with chili or to make dinner rolls. It also has a recipe for baked barbecue chicken that I've adapted a bit that is the ultimate comfort food on cold winter days. It's where I found my meatloaf with piquant sauce recipe that my mother-in-law loves so much. It has served me well. This is paperback book and never particularly sturdy. It is now several pieces. This book introduced me to the joy of muffins. It included a quick mix which I kept in my refrigerator for years. With it I could have muffins mixed up and in the oven in less than 5 minutes with the scent of baking bread soon wafting to calm hungry youngsters with hope of good things to come. Their soft crumbs make it an ideal bread for toddlers who are not generally fond of the chewy foods we sometimes offer them. 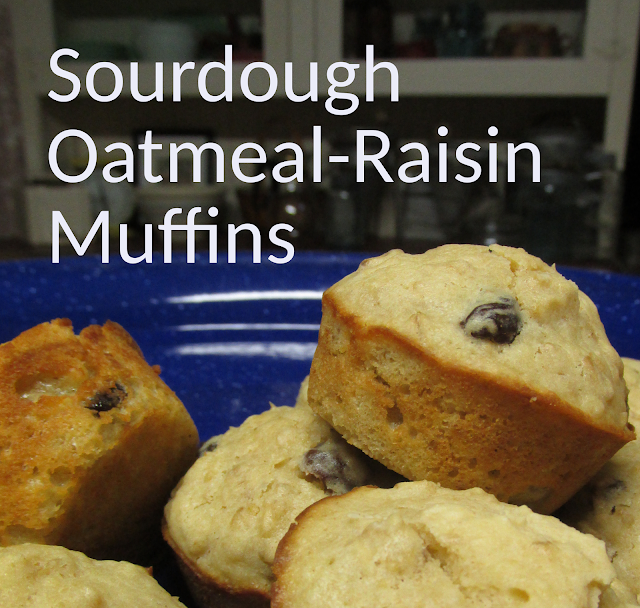 Muffins are adaptable to all kinds of healthy additions like fruits, whole grains and even zucchini. Compared to cookies, they have a lot less fat but still can make a sweet treat. This book was a Christmas gift from my mother-in-law. I found this book on the shelves of our local public library and I checked it out over and over again. 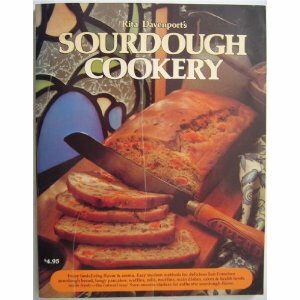 This is where I learned the mysteries and beauty of baking with sourdough. Davenport's recipes are inventive and absolutely wonderful! Exceptional sourdough banana bread, zesty sourdough biscuits and waffles and easy-to-make (no kneading, just stirring) sourdough butterflake refrigerator rolls have become regulars on my menus. Most of her recipes include the addition of leavening such as yeast, baking powder or baking soda so not all sourdough purists approve, but I am a fan! My Recipe Notebook - There's no photograph of this book because it is simply a three-ring notebook. It contains recipe cards, recipes clipped out of magazines and photocopies of recipes all slipped into plastic page protectors. This is a big improvement over my recipe box where recipes were hard to find and tended to get jumbled together. Buhler Centenniel Cookbook- A treasure because of all the Low German ethnic dishes like moos, New Year's Cookies, peppernuts and varnika, I most often turn to page 261 for its Carmel Cuts and Cherry Bars. It also contains the Mrs. Field's Cookie recipe that makes a huge batch. I bake some and freeze the remainder in logs so that warm, fresh cookies are just 15 minutes away. A recipe from my mother is included in the book and each section is illustrated by Karen Yoder, an old friend. Among Friends with Heart and Soul - Each recipe is beautifully illustrated by Shelly Reeves-Smith. It's fun to look though just for the pictures. It has several outstanding coffee cake recipes. This was a gift from a moms' group that I worked with at one time. Garden Way's Joy of Gardening Cookbook - This was another public library find. I've checked it out several times. All of the recipes are vegetable related and are sectioned by specific vegetables. For some great ideas of what to do with all your zucchini, this is your book. While preparing for this blog, I found it available on Amazon for 49 cents ($3.99 shipping) so I'll soon be receiving a personal copy. Do you have a favorite recipe cookbook? I'd love to hear about it! Please tell me about it in the comments below.